The microbial cold war between species has been widely studied and is, in my opinion, one of the most interesting topics in current biology. Fungi make compounds to destroy bacteria, bacteria make compounds to destroy fungi. But it doesn't stop there. Phages mutate constantly to evade bacterial defenses. We've known about a handful of bacterial defenses against phage-- repressor systems, restriction enzymes, receptor modification, DNA modification, etc. But now, there is another form of bacterial defense. We have evidence for, what I will call, the "special forces" of bacterial defense systems. Heck, I'd liken this to a form of adaptive immunity. CRISPR (clustered, regularly interspaced, short, palindromic repeats) sequences have been found in 40% of all sequenced Bacteria and 90% or sequenced Archaea. Essentially, you have an array of nearly identical repeats which form RNA stem-loops. Between the repeats, you find unique DNA that has sequence similarity to phages. There are also a handful of unique genes that are closely associated with the arrays. The idea is that the bacteria are using an RNA interference mechanism. The CRISPR array gets transcribed and then spliced at the loop structures--forming small RNAs. These sRNAs associate with phage nucleic acids, recruit degradation genes, and subsequently denature the phage nucleic acid. See the figure at right taken from the review article. You find a distinct correlation between the number of CRISPR sequences and resistance. You also can add specific phage sequence to the array and grant immunity. If you then take that sequence away, immunity is lost. What is interesting (but not necessarily surprising)is that a small population of phage remained resistant to the system. It was found that these phage had a slightly different nucleic acid sequence at the site. 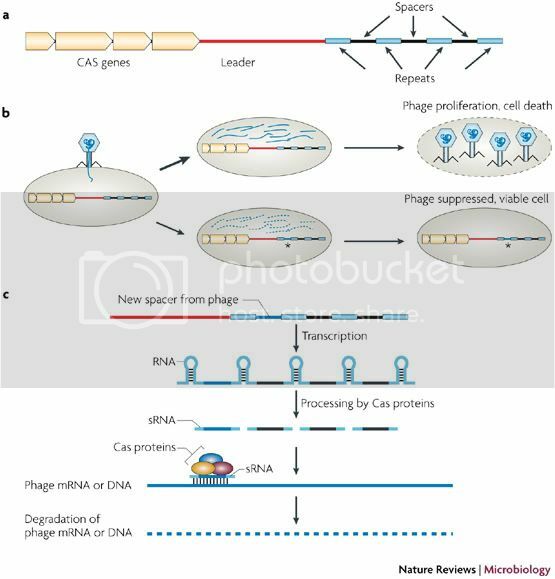 BUT, given time, the bacteria can acquire CRISPR sequence against the phage. It's an evolutionary arms race! That we should be exploiting! There are a variety of ramifications that this system can and will have on the future of molecular biology. For one, a system of spoligotyping could be developed based on the unique spacer regions in the CRISPR array. Apparently a large problem in dairy industry (specifically yogurt and cheese) is that bacterial cultures get lost to phage. This system could help prevent that by allowing the development of ultra-resistant strains. A more unique (and as far as I know, untested) use would be the development of a system to knock out genes in vivo. You could imagine setting up a CRISPR system on a plasmid with specificity for a specific gene (or multiple genes) you want to knock out. The CRISPR system would do what it does naturally and degrade the gene's transcript. Since these regions are only 26-72bp, it would certainly be an awesome tool to have--especially for organisms notoriously recalcitrant to genetic manipulation (like my favorite bugs: the Mycobacteria). Genes could be effectively silenced using only a plasmid, without the need for messy recombination systems.